Monitoring Center of Russia’s CCSHR to collect data on problems faced by media outlets | Russian Legal Information Agency (RAPSI). 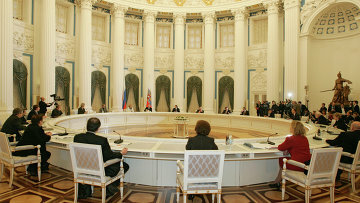 MOSCOW, March 7 (RAPSI) – The standing commission on freedom of information and journalists’ rights at Russia’s Presidential Council for Civil Society and Human Rights (CCSHR) is launching a monitoring center aimed to protect media outlets, the Council’s press-service reports on Thursday. Regional media outlets most often find themselves in the situations, where their rights are violated; however exactly these outlets have the best command of problems encountered by ordinary people, Alexander Alymov, the Center’s coordinators has said. According to Alymov, the work on the formation of teams, to which any journalist is free to join and report of his or her problems, is to start in the nearest future. Upon analyzing the respective information, the Center is to submit it to the Council’s commission, which is to develop situation-specific solutions. 12:01 07/03/2019 The standing commission on freedom of information and journalists’ rights at Russia’s Presidential Council for Civil Society and Human Rights (CCSHR) is launching a monitoring center aimed to protect media outlets.